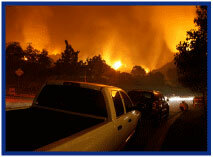 Wildfires can very rapidly destroy ground vegetation, forests, animals, homes, and sometimes, people. As of today, there are twelve active "large incident" fires in the US, which have burned hundreds of thousands of acres, mostly in California. This video shows how quickly fire can spread in just a few seconds. YouTube is full of videos such as this and this with people waiting until it is almost too late to evacuate. It was just a year ago that over 700 homes were destroyed in a massive fire covering several California towns. In August Chubb announced the expansion of its Wildfire Defense Services which combined the programs of Fireman's Fund, ACE, and Chubb. For Platinum policyholders, this means that all areas of Texas are now eligible. It also means that legacy ACE and Fireman's Fund policy holders are now eligible in North Dakota and South Dakota. Review more information on eligibility in the Wildfire Defense Services here. This is just one of the exciting changes happening at with Chubb since the merger with ACE & Fireman's Fund. Earlier this year Chubb announced a new H2O Damage Defense service and partnership with ADT which we detailed a few weeks ago. Completion of the Fireman's Fund Conversion - The vast majority of the conversion will be completed in 2016, with only a very small percentage of policies still in-force as a result of withdrawal requirements. Rebranded Policy Paper - Chubb will soon intorduce rebranded Platinum Portfolio and Masterpiece policy paper, reflecting the new Chubb name and brand identity, will be released soon. New Bill Format for Masterpiece Policyholders - Chubb plans to enhance the content and format of their bill for Masterpiece and other legacy Chubb customers. The revised bill will make it easier for clients to understand their billing statement, identify what coverage the bill relates to, and choose from a variety of convenient payment options. The Chubb Masterpiece Program is available to registered members in all states except Auto in HI, KY, MA, NC, SC and VA as those are being placed in the legacy-ACE system. Additionally, NJ auto & NC home business is being written in the Chubb Non-Masterpiece environment. Learn more by logging into www.bigimarkets.com and click on Affluent Program - New Business. Join FEMA On October 11th at 10:00 AM - Noon CDT for an informative webinar providing a practical look at how FEMA flood map changes can affect property owners in their roles as flood insurance policyholders as well as borrowers. 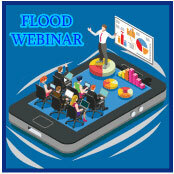 Find out how to ease the transition to new flood maps for your clients. Learn how to provide better service to them by understanding how mapping changes affect policy rates, premiums, and the mandatory purchase of flood insurance. This course will also review flood mapping issues related to Letters of Map Change and the Newly Mapped procedure. Enroll in an upcoming session and learn how to best help your clients both before and after map changes occur. Register by clicking here. These webinars are FREE to attend, but spaces are limited. No Continuing Education credits are offered for these courses in any state. As we enter the prime foliage season, many Americans are planning adventures to enjoy the fall splendor. Few places put on as magnificent a show as the Blue Ridge Parkway. This road is over 460 miles long and ranges along the Appalachian Mountains of Virginia to the Smokey Mountains of North Carolina. The parkway began in 1935 and was completed in 1966. In October it is said that in some stretches you can see winter, fall, and summer all at once from the cold and windy tops, the surrounding brilliant colors of the autumn leaves leading down into the still warm and green valleys below. Numerous cities and towns, lookout points, historic sites, observation towers, hiking trails, a music center, and more are spread out along the parkway making it more than just a one-day trip. 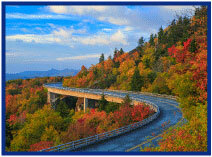 Other areas of the country also offer beautiful fall foliage scenic routes. One might not think of travel insurance when planning a fall colors tour, but even a Blue Ridge Parkway trip can turn into a weeklong affair with airline, travel and lodging needs, among others. Travel Insurance can cover accident and sickness medical expense, emergency medical evacuation/repatriation, trip delays, cancellation, interruption, missed connections due to severe weather or many others reasons outside the traveler's control. Coverage will be issued and confirmed in Big "I" Markets. The TII travel blog covers a myriad of travel related subjects, including sleeping on flights, honeymoon planning tips, using a cellphone abroad, and picking the right hotel, just to name a few. Travel Insurance is currently available to members in all states. 1 Rates, waiting periods, and coverages can vary in FL, IA, KS, NY & WA. The ACT Small Commercial Rating work group is focusing on driving cross-industry consistency and ease of use for agents using their management systems to get customer quotes for small commercial lines. Join work group Co-Chairs, Jim Armitage and Susan LaBarre, as they talk about the work group's goals, and delve into their creation of a recently-release "Carrier Bridging Best Practices" document. This is a strategic template to create consistent workflows and ultimately increase overall utilization of small commercial rating using management system 'bridging' functionality. There will also be discussion on the ongoing challenges for small commercial lines and steps the work group will take next on this. 1. The National Fire Protection Association states there were 1,345,500 reported fires in 2015. How many were "outside and other" fires? 2. What famous comic detective debuted on this day (October 4) in 1931? 3. The NFIP paid out over $839 million in claims in 2015. Which state received more than 60% ($520 million) of it? “Autumn is a second spring when every leaf is a flower.” This is a quote by which Algerian-born writer? Congratulations to our agent in New Mexico on a vacant dwelling - non-standard sale of $5,123 in premium!